Mischo Beauty Luxury Nail Lacquer in Coco – a bright, pure white crème. Love this! It is hard to find a good white polish that is not powdery or streaky, but this one works. Zoya Nail Polish in Jacqueline – This is an off-white crème with slight yellow undertones. This would look great on medium, olive skintones. Ginger+Liz Colour Collection in Boy Toy – A light cyan colour. This has theeeeeeeee finest pearlescence. When worn, it is indistinguishable, here it made the cut. This colour is discontinued but I also have a good dupe, Zoya in Wednesday. Mischo Beauty Luxury Nail Lacquer in Birthday Suit – A soft seashell pink. This is very grown up, not your typical default nailshop colour. This has a touch of grey and I could not resist buying this colour. So those are my favourites! 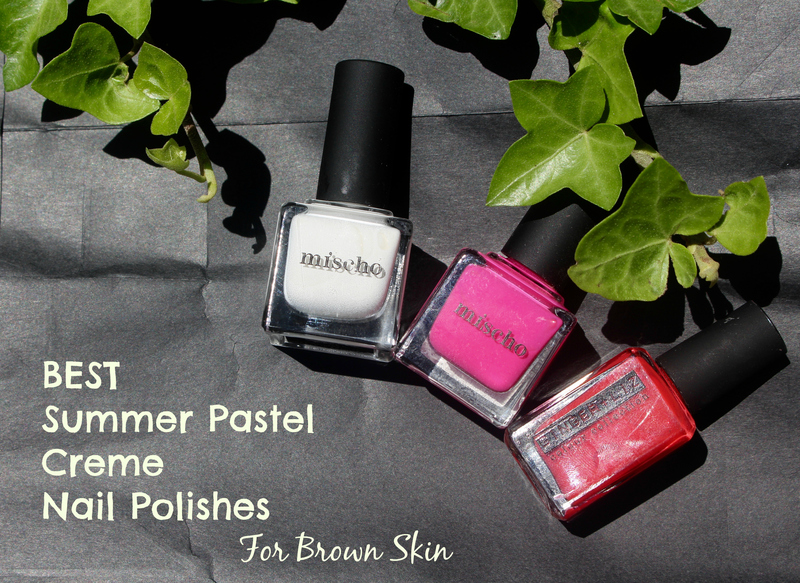 Let me know if you have tried any of these shades and what are your favourite pastels to wear. If you liked this post, be sure to sign up my email newsletter. It’s easy and get access to more beauty and natural hair posts like this, my brights nail polish post and many more!